A trackback a week or two ago to my blog from this personal blog post: #SNAc week 1: what are networks and what use is it to study them? 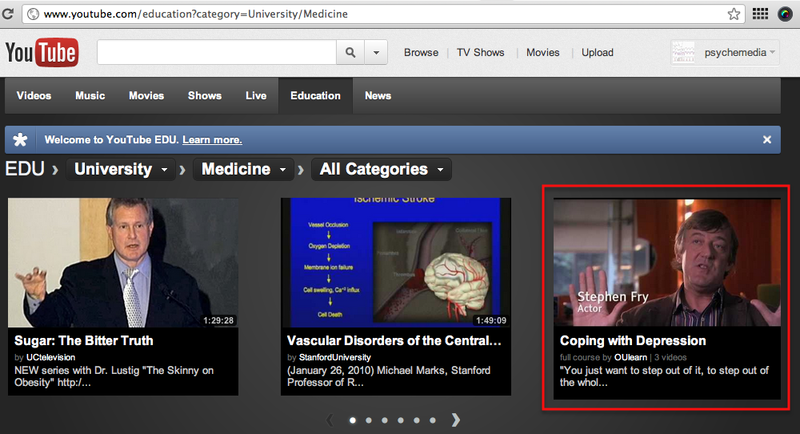 highlighted me to a MOOC currently running on Coursera on social network analysis. The link was contextualised in the post as follows: The recommended readings look interesting, but it’s the curse of the netbook again – there’s no way I’m going to read a 20 page PDF on a screen. Some highlighted resources from Twitter and the forum look a bit more possible: … Some nice ‘how to’ posts: … (my linked to post was in the ‘howto’ section). Note that Coursera, Udacity and edX are all making an offering based on quite a traditional course model idea and are born out of particular subject disciplines. Contrast this in the first part with something like Khan Academy, which is providing learning opportunities at a finer level of granularity/much smaller “learning chunks” in the form of short video tutorials. Khan Academy also provides the opportunity for Q&A based discussion around each video resource. Also by way of contrast are the “cMOOC” style offerings inspired by the likes of George Siemens, Stephen Downes, et al., where a looser curriculum based around a set of topics and initially suggested resources is used to bootstrap a set of loosely co-ordinated personal learning journeys: learners are encouraged to discover, share and create resources and feed them into the course network in a far more organic way than the didactic, rigidly structured approach taken by the xMOOC platforms. The cMOOC style also offeres the possibility of breaking down subject disciplines through accepting shared resources contributed because they are relevant to the topic being explored, rather than because they are part of the canon for a particular discipline. Something worth considering about the evolution of open education from early open content/open educational resource (OER) repositories and courseware into the “Massive Open Online Course” thing is just what caused the recent upsurge in interest? Both MIT opencourseware and the OU’s OpenLearn offerings provided “anytime start”, self-directed course units; but my recollection is that it was Thrun & Norvig’s first open course on AI (before Thrun launched Udacity), that captured the popular (i.e. media) imagination because of the huge number of students that enrolled. Rather than the ‘on-demand’ offering of OpenLearn, it seems that the broadcast model, and linear course schedule, along with the cachet of the instructors, were what appealed to a large population of demonstrably self-directed learners (i.e. geeks and programmers, who spend their time learning how to weave machines from ideas). 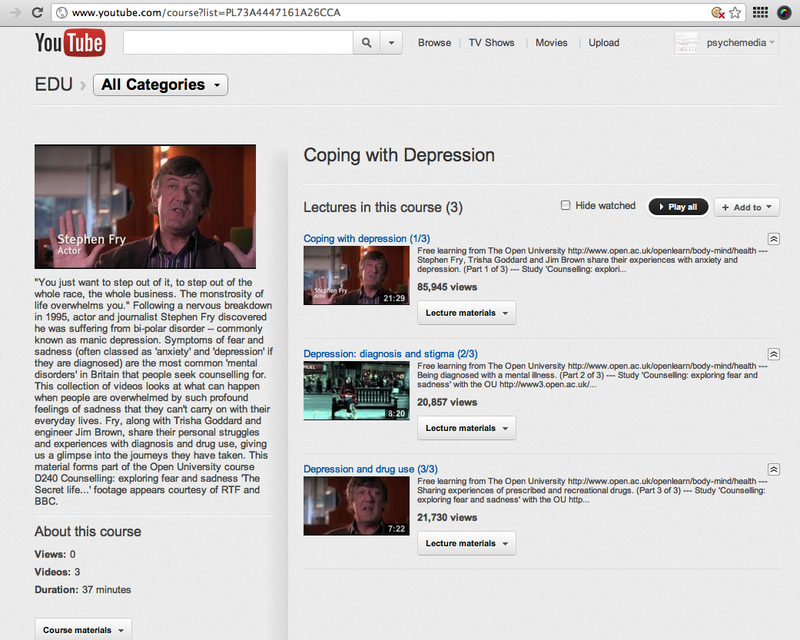 Similar to other Knight Center online courses, this MOOC is divided into weekly modules. But unlike regular offerings, there will be no application or selection process. Anyone can sign up online and, once registered, participants will receive instructions on how to enroll in the course. Enrollees will have immediate access to the syllabus and introductory information. 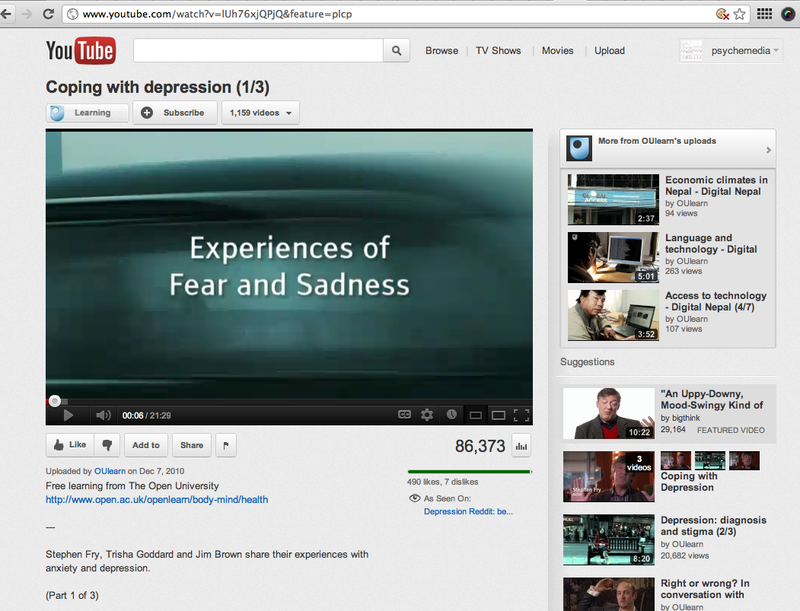 The course will include video lectures, tutorials, readings, exercises and quizzes. Forums will be available for discussion topics related to each module. Because of the “massive” aspect of the course, participants will be encouraged to provide feedback on classmates’ exercises while the instructor will provide general responses based on chosen exercises from a student or group of students. Cairo will focus on how to work with graphics to communicate and analyze data. Previous experience in information graphics and visualization is not needed to take this course. With the readings, video lectures and tutorials available, participants will acquire enough skills to start producing compelling, simple infographics almost immediately. Participants can expect to spend 4-6 hours per week on the course. Although the course will be free, if participants need to receive a certificate, there will be a $20 administrative fee, paid online via credit card, for those who meet the certificate requirements. The certificate will be issued only to students who actively participated in the course and who complied with most of the course requirements, such as quizzes and exercises. The certificates will be sent via email as a PDF document. No formal course credit of any kind is associated with the certificate. They need to be appropriately licensed (if we have to go through a painful rights clearnance and rights payment model, the cost benefits of drawing on and freely reusing those resources are severely curtailed). One thing I’ve realised from looking at Digital Worlds uncourse blog stats is that some of the posts attract consistent levels of traffic, possibly because they have been embedded to from other course syllabuses. I also occasionally see flurries of downloads of tutorial files, which makes me wonder whether another course has linked to resources I originally produced. If we think of the web in it’s dynamic and static modes (static being the background links that are part of the long term fabric of the web, dynamic as the conversation and link sharing that goes on in social networks, as well as the publication of “alerts” about new fabric (for example, the publication of a new blog post into the static fabric of the web is announced through RSS feeds and social sharing as part of the dynamic conversation)), then the MOOCs appear to be trying to run in a dynamic, broadcast mode. Whereas what interests me is how we can contribute to the static structure of the web, and how we can make better use of it in a learning context? PS a final thought – running scheduled MOOCs is like a primetime broadcast; anytime independent start is like on-demand video. Or how about this: MOOCs are like blockbuster books, published to great fanfare and selling millions of first day, pre-ordered copies. But there’s also long tail over time consumption of the same books… and maybe also books that sell steadily over time without great fanfare. Running a course once is all well and good; but it feels too ephemeral, and too linear rather than networked thinking to me? I’ve posted before about using mindmaps as a navigation surface for course materials, or as way of bootstrapping the generation of user annotatable mindmaps around course topics or study weeks. The OU’s XML document format that underpins OU course materials, including the free course units that appear on OpenLearn, makes for easy automated generation of secondary publication products. So here’s the next step in my exploration of this idea, a data sketch that generates a Freemind .mm format mindmap file for a range of OpenLearn offerings using metadata puled into Scraperwiki. 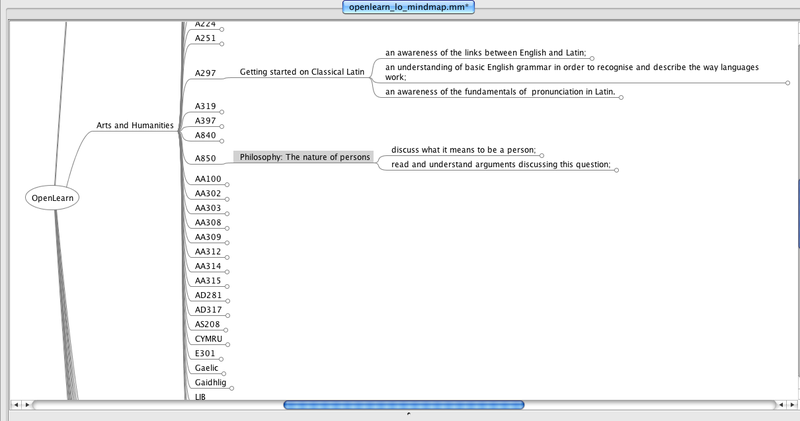 The file can be downloaded to your desktop (save it with a .mm suffix), and then opened – and annotated – within Freemind. You can find the code here: OpenLearn mindmaps. 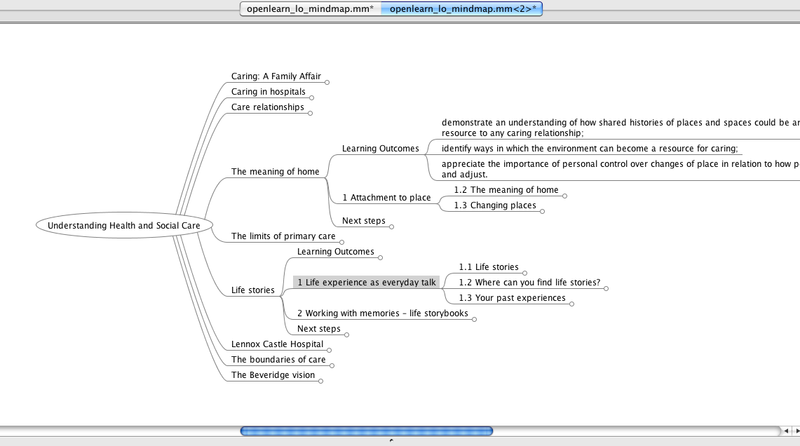 By default, the mindmap will describe the learning outcomes associated with each course unit published on the Open University OpenLearn learning zone site. ?unit=UNITCODE, where UNITCODE= something like T180_5 or K100_2 and you will get a view over section headings and learning outcomes that appear in the corresponding course unit. ?unitset=UNITSET where UNITSET= something like T180 or K100 – ie the parent course code from which a specific unit was derived. This view will give a map showing headings and Learning Outcomes for all the units derived from a given UNITSET/course code. Via @lauradee, I see that the OU has a new offering on YouTube.com/edu is far more supportive of links to related content, links that can represent the start of a learning journey through OU educational – and commentary – content on the OU website. The placing of content links into the Assignments and Others tabs always seems a little arbitrary to me from this single example, but I suspect that when a few more lists have been posted some sort of feeling about what sorts of resources should go where (i.e. what folk might expect by “Assignment” or “Other” resource links). If there’s enough traffic generated through these links, a bit of A/B testing might even be in order relating to the positioning of links within tabs and the behaviour of students once they click through (assuming you can track which link they clicked through, of course…)? 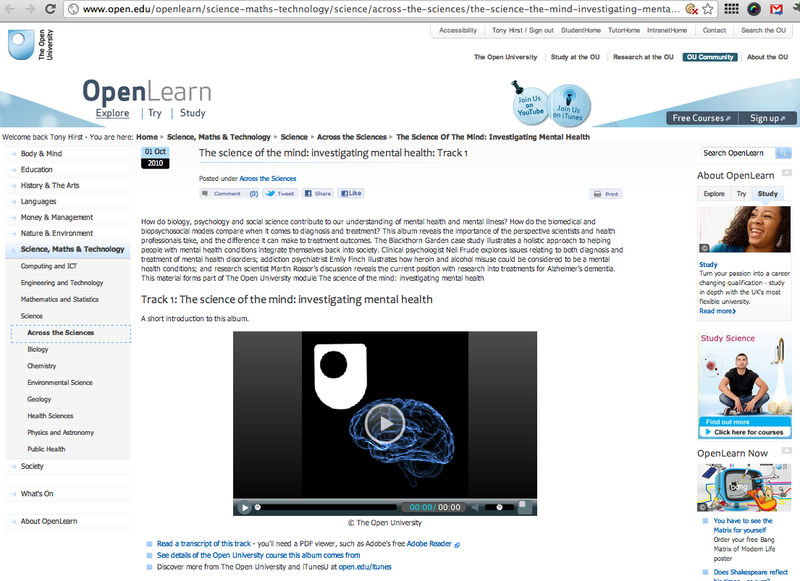 And as far as the linkage itself goes, I’m wondering: how are the links to OpenLearn course units and articles generated/identified, and are those links captured in one of the data.open.ac.uk stores? Or is the process that manages what resource links get associated with lists and list items on Youtube/edu one that doesn’t leave (or readily support the automated creation of) public data traces? 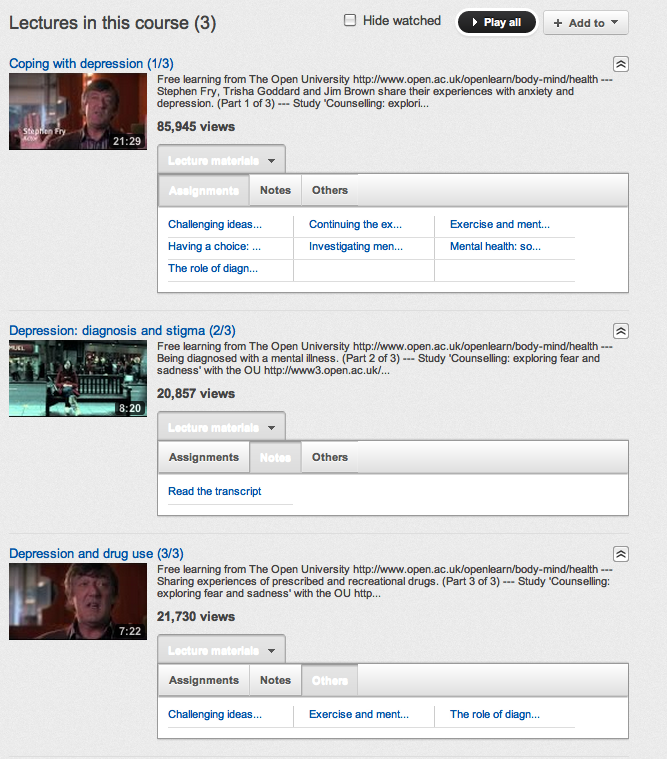 A long time ago, I tinkered with various ways of disaggregating OpenLearn course units into various components – images, audio files, videos, etc. (OpenLearn_XML Asset stripper (long since rotted)). Over the last few weeks, I’ve returned to the idea, using Scraperwiki to trash through the OpenLearn XML (and RSS) in order to build collections out of various different parts of the OpenLearn materials. So for example, a searchable OpenLearn meta-glossary, that generates one big glossary out of all the separate glossary entries in different OpenLearn units, and an OpenLearn learning outcomes explorer, that allows you to search through learning outcomes as described in different OpenLearn courses. I’ve also been pulling out figure captions and descriptions, so last night I added a view that allows you to preview images used across OpenLearn: OpenLearn image viewer. To limit the viewed images, you can filter results according to terms appearing in the captions or descriptions or by course unit number. 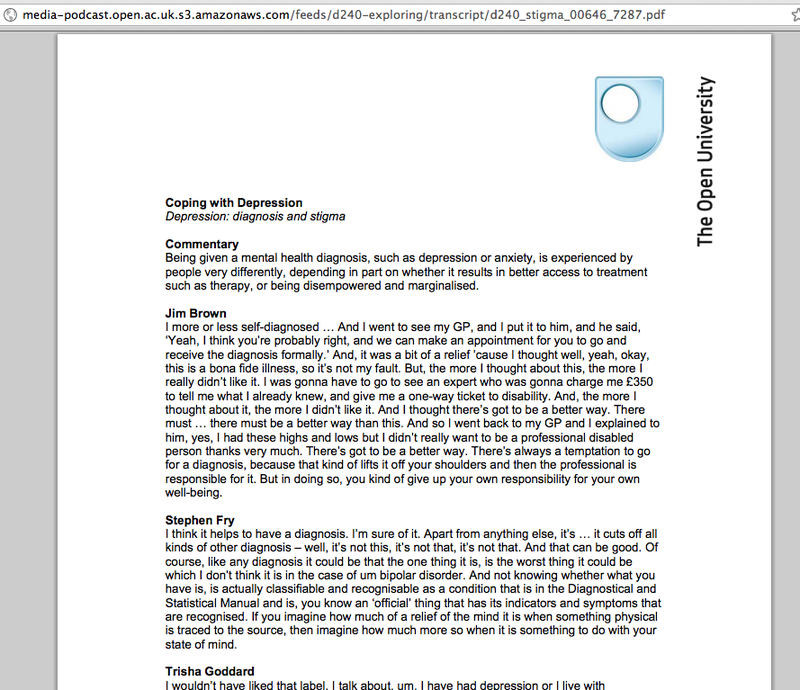 PS here’s an example of why the ‘need a cookie to get the image’ thing is really rather crap… I embedded an image from OpenLearn, via a link/url, in a post (making sure to link back to the original page). Good for me – I get a relevant image, I don’t have to upload it anywhere – good for OpenLearn, they get a link back, good for OpenLearn, they get a loggable server hit when anyone views the image (although bad for them in that it’s their server and bandwidth that has to deliver the image). Do We Need an OpenLearn Content Liberation Front? For me, one of the defining attributes of openness relates to accessibility of the machine kind: if I can’t write a script to handle the repetitive stuff for me, or can’t automate the embedding of image and/or video resources, then whatever the content is, it’s not open enough in a practical sense for me to do what I want with it. URLs of the form http://openlearn.open.ac.uk/course/view.php?name=S278_12 link to a ‘homepage” for each unit, which then links to the first page of actual content, content which is also available in XML form. 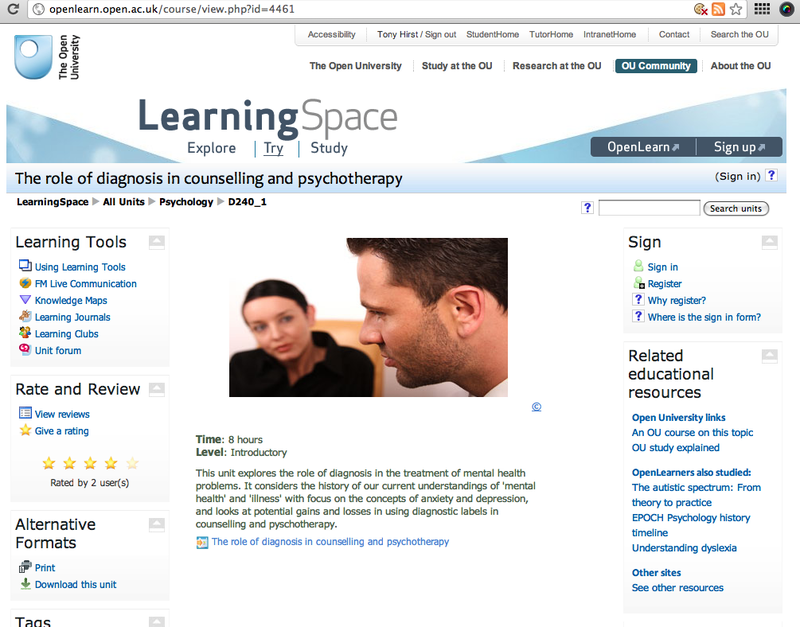 The content page URLs have the form http://openlearn.open.ac.uk/mod/oucontent/view.php?id=398820&direct=1, where the ID is one-one uniquely mapped to the course name identifier. The XML version of the page can then be accessed by changing direct=1 in the URL to content=1. 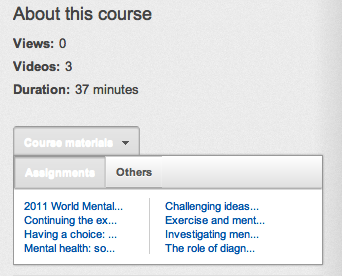 Only, we don’t know the mapping from course unit name to page id. The easiest way I’ve found of doing that is to load in the RSS feed for each unit and grab the first link URL, which points the first HTML content page view of the unit. #Handle each topic area separately? But I can’t seem to find a crib for the second identifier – 476 – anywhere? Which means I can’t mechanise the creation of links to actually OpenLearn image assets from the XML source. Also note that there are no credits, acknowledgements or license conditions associated with the image contained within the figure description. Which also makes it hard to reuse the image in a legal, rights recognising sense. Reusing images on the basis of the OpenLearn XML “sourcecode” document is therefore: NOT OBVIOUSLY POSSIBLE. What this suggests to me is that if you release “source code” documents, they may actually need some processing in terms of asset resolution that generates publicly resolvable locators to assets if they are encoded within the source code document as “private” assets/non-resolvable identifiers. (which presumably uses the Alternative label as the cross-referenced identifier, although not the figure element id (eg fig007) which is presumably unique within any particular XML document? ), this identifier is not used to link the informally stated figure credit back to the uniquely identified figure element? If the same image asset is used in several course units, there is presumably no way of telling from the element data (or even, necessarily, the credit data?) whether the images are in fact one and the same. That is, we can’t audit the OpenLearn materials in a text mechanised way to see whether or not particular images are reused across two or more OpenLearn units. Just in passing, it’s maybe also worth noting that in the above case at least, a description for the image is missing. In actual OU course materials, the description element is used to capture a textual description of the image that explicates the image in the context of the surrounding text. This represents a partial fulfilment of accessibility requirements surrounding images and represents, even if not best, at least effective practice. PS sort of related to this, see TechDis’ Terry McAndrew’s Accessible courses need and accessibilty-friendly schema standard. Author Tony HirstPosted on March 13, 2012 March 13, 2012 Categories Open Content, Open Education, OU2.0Tags eSTEeM, openlearn, ukoer8 Comments on Do We Need an OpenLearn Content Liberation Front?